Marketing Information: The high-performance AXIS M31-R Network Cameras are specially designed for video surveillance in buses, trains, subway cars and emergency vehicles.The rugged and discreet AXIS M31-R cameras have protection against dust and water, and can withstand tough conditions such as vibrations, shocks, bumps and temperature fluctuations. 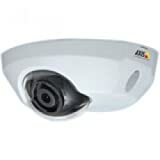 In addition, the cameras’ active tampering alarm can detect tampering attempts such as blocking or spray-painting.The series includes AXIS M3113-R cameras with SVGA resolution and AXIS M3114-R cameras, which can stream 1 megapixel, as well as HDTV 720p, at full frame rate.The cameras are specially adapted to respond quickly to changes in light levels, ensuring that high image quality is maintained. In addition, the use of progressive scan enables the cameras to show moving objects without distortion.